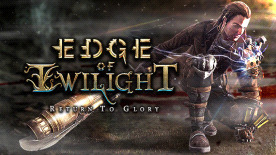 "Edge of Twilight - Return to Glory" is a 3rd person action adventure game presenting a unique post-apocalyptic, steampunk fantasy world that has been split into separate realms of Day and Night. Players take the role of Lex, an outcast bounty hunter who finds himself caught amidst the clash of two polar opposite civilizations, the industrial Atherns and the spiritual Lithern, the result of impetuous greed for a solitary source of energy. Players will discover that Lex is the only living halfbreed in the world, rejected by society and burdened with the unique ability to venture through the two parallel realms. Ironically, that society will soon learn that his halfbreed heritage is the last chance their world has to escape complete darkness. During his journey, Lex will become part of an increasingly complex and enthralling storyline that will blur the line between good and evil, right and wrong. A story of wildly interesting characters, over-the-top action, and deep, ornate mysteries set within a universe where anything is possible.